Sorry, this job expired on Dec 15, 2018. Below are other jobs that may be of interest to you. It’s not just our music that’s turned up to 11, but our career opportunities too! Ready for a career that’s full of flavor? Prepare yourself for Taco Bamba! Chef Victor Albisu has more than a decade of experience in fine dining and upscale French, American and Latin American restaurants. He combines his culinary education with his Latin American heritage & his love of rock and roll music to bring a unique style of cuisine to Taco Bamba. At Taco Bamba, we’re more than just tacos. We believe that individuality, hard work, integrity, and respect are qualities to be coveted. Becoming part of the Taco Bamba family doesn’t just grant you a job – it empowers you with skills and a reputation that will last a lifetime. We offer competitive pay, a flexible work schedule, and the opportunity to advance to other areas of our growing Taco Empire. More importantly, it’s a fun place to work! We’re always looking for hard-working and unique individuals to accompany us on our mission of serving food with attitude. 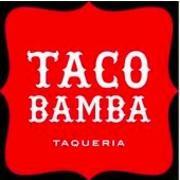 To be the face of Taco Bamba to our guests. A cashier needs to be outgoing, and friendly to ensure the best possible experience for each and every guest. To greet guest as they walk in, guide guests through the ordering process and suggestively sell all menu items. Efficiently use menu screens to ring up customers correctly. Cashiers must be able to communicate well with others and handle themselves professionally in high stress situations. Assist with opening and closing restaurant duties and re-stocking. Portion salsas as listed on the prep sheet.